The classic cooperative apartment house at 2006 Washington Street was designed by renowned architect, C.A. Meussdorffer in 1924. It is the ‘crown jewel’ of Pacific Heights, set in a beautifully landscaped tranquil garden. The handsome driveway with turnaround paved in a herring bone pattern leads to the impressive portico and lobby where the doorman welcomes residents and their guests. The sense of arrival is next to none in the City! Apartment No. 4 is a full floor apartment which enjoys views of the Golden Gate Bridge, Alcatraz Island and the bay along with the greenery of Lafayette Park. 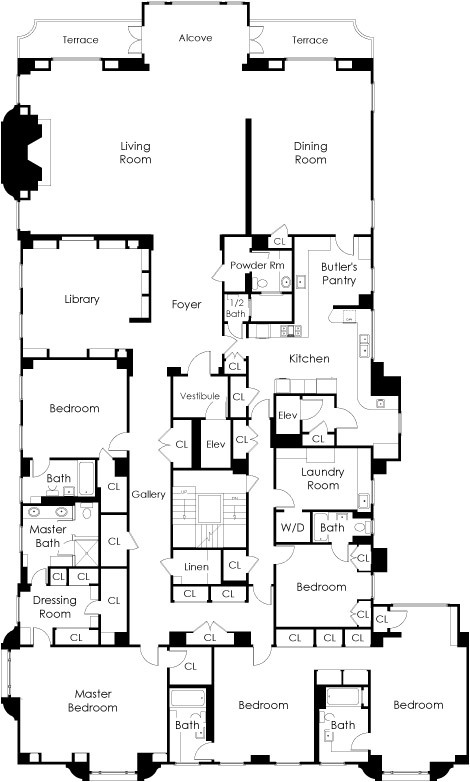 The spacious floor plan is ideal for elegant entertaining and comfortable City living. The well-proportioned public rooms feature high ceilings, deep crown molding and lovely parquet floors. The private elevator vestibule opens to the gracious RECEPTION HALL immediately introducing glorious views; a POWDER ROOM and guest closet adjoin. The spacious view LIVING ROOM features an ornate marble fireplace and tall bay windows to the water view; French doors open to double view TERRACES. The formal view DINING ROOM provides a perfect setting for elegant dinners. The KITCHEN with breakfast area & butler’s pantry awaits the new owner’s custom installation. The impressive GALLERY with indirect lighting leads to the private quarters which comprise a library and four sunny bedrooms with ample closets and four full baths. The paneled LIBRARY with custom bookshelves and cabinets enjoys views of the Spreckels mansion and Golden Gate Bridge to the west. The GUEST BEDROOM/AT-HOME OFFICE looks to the west and has a FULL BATH. dressing room. The middle BEDROOM overlooks the park and has an adjoining FULL BATH. The southeast ‘morning’ BEDROOM with alcove enjoys both park and bay views; a FULL BATH adjoins. Completing the floor plan are the LAUNDRY and MAID’S ROOMS, service elevator and staircase located off the service hall. HOA DUES. $4,907.85 per month, includes: Insurance, water and scavenger; utilities are billed separately every six months. Unit No. 4 comprises 9.54 per cent of the shares of stock of 2006 Washington Street, Incorporated; the sale is subject to approval of the stock cooperative.